Non-destructive: Nothing is baked in. All your recording data is captured and stored at the native framerate and full resolution of the device. Computed shapes: Quickly choose from presets to create perfect shapes as the building blocks of your animation. High precision: All animation processing is done at 32-bit float. Real-time preview: Visualize your animation with a large 3D view that is easy to navigate. Standard formats including JPEG and PNG. Specialist formats including: CSV (Comma-separated values). Export formats: HitFilm composite shot. Canvas: View your animation in 2D as it is drawn. With the use of the Action Pencil app, you can see this drawing in real-time. Mouse: No need for tedious keyframing - just click and drag to draw your animation. Action Pencil: This new accompanying app gives you the ability to draw using your fingertip or a stylus on an iPhone or iPad. CSV import: Map out the keyframe positions in a .csv file and import it into Action Pro to get the perfect line, spiral or any other shape. Shapes: Choose from ready-made animation presets including Curves, Circle and Archimedean Spiral to use in your next project. Slice tool: Cut individual recordings onto multiple tracks with one click. Stretch tool: Drag the recording temporally to make it longer or shorter. 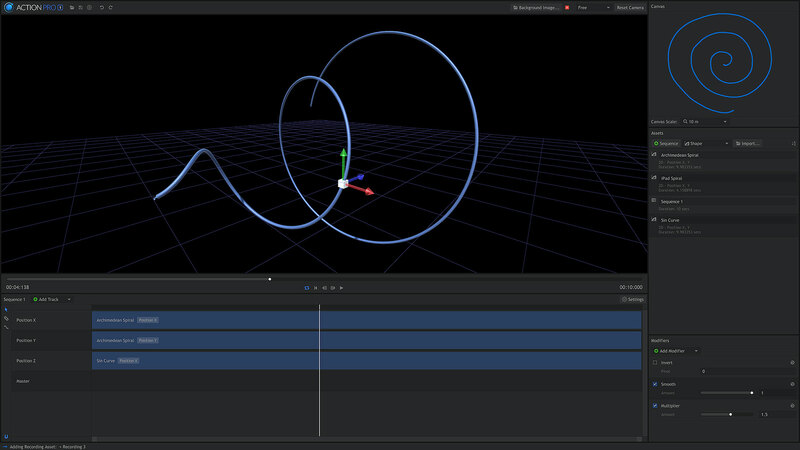 Dimension tracks: Adjust the position, scale and rotation properties of your animation. Master track: Need to adjust all of your position values at once? Use the master track to apply a value or a filter to everything. Modifiers can be applied to the 2D data in the Sequence Items and Tracks. Some can also be applied to the Master Track. Smooth: Even out some of the more harsh angles of your animations. Particularly useful for aircraft landings, vehicle movement etc. Invert: Invert the value of the item or track. Multiply: Multiplies the value in the item or track, allowing you to make it larger or smaller. Hard clamp: Limit the top and bottom values to restrict the set. Action Pro is heavily GPU accelerated. For the best performance it&apos;s recommended to update your GPU drivers to the latest version before running Action Pro. Action Pro comes with a range of free training resources to support you. While you learn, our online support systems are ready to provide you with technical guidance. Free video tutorials: The FXhome YouTube channel contains hundreds of videos educating our users on different FXhome software. Online community forum: If you’re looking for hands-on tips and tricks and can’t wait for another tutorial to come out, our forum is the place to be. With an extremely active and friendly community of users, you’ll have the answers you need in no time.